Since the application of the tech17 is now live here (disclaimer: for the official information about the OGh Tech17, go to www.tech17.nl), it is time to adjust the security settings. 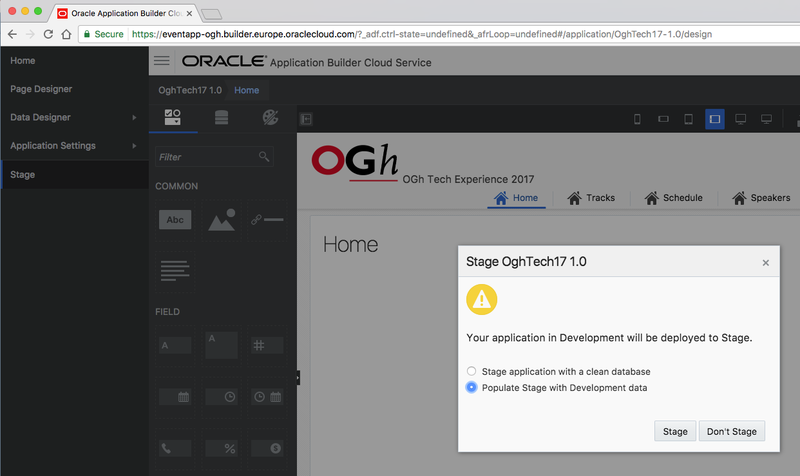 By default when trying to access the application you need to login to the Oracle Cloud to be able to access the application. 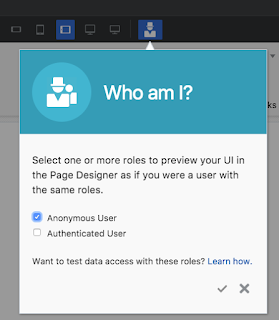 To give public access, I will create an anonymous role and add certain pages to the anonymous role, after that they should be visible without the need to login first. In the main menu, I go to the security settings. On the left hand side in the Access panel, I can select to allow anonymous access. This means there will be a role created for the anonymous-users. After ticking the checkbox, you will see an extra role appear in the Roles section of the page. 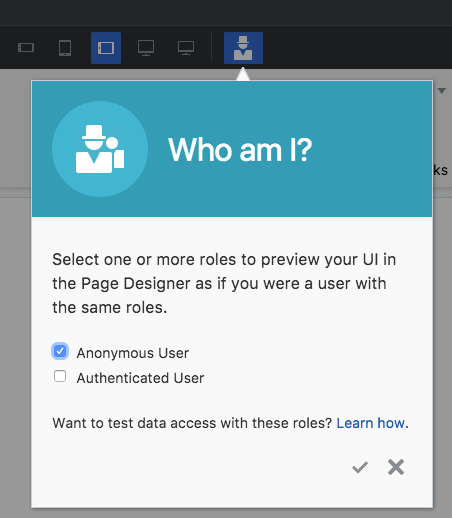 There is now an Anonymous User role. Under the Roles sections, you see the Pages section, here you can map the pages to certain roles. 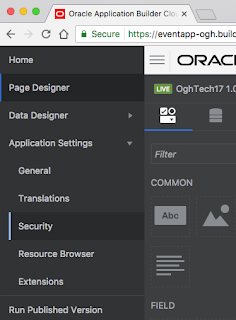 I make the Home and Tracks pages accessible for anonymous users, but the other pages in the menu are not. 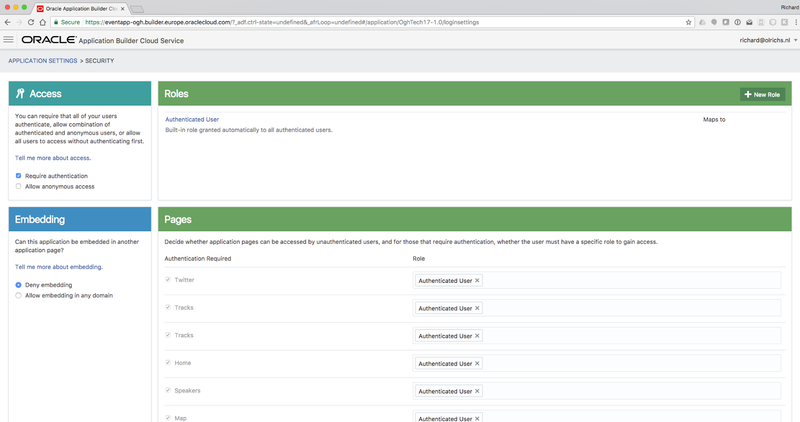 Now that we have adjusted the security settings, you can actually see the result of this action already in the Page Designer. In the top menu on the right there is an icon that looks like a person. When you hover over it, it says 'Who am I?'. Here you can change the role that you have while making more adjustments to your page. If you click the icon, you will get a screen where you can select the various roles. In my case I choose the newly created role anonymous. 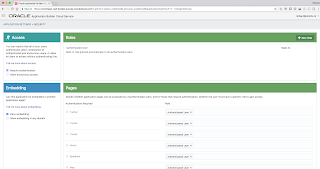 This results in the Page Designer acting accordingly and only displaying the Home and Tracks menu items for this role. 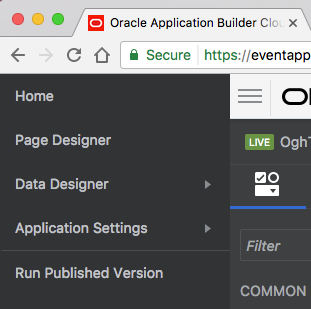 When you are done developing the first version of your application, you might want to go live with it. 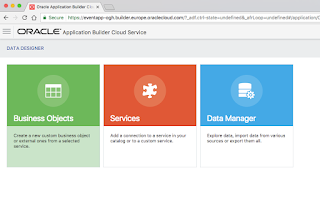 Within ABCS there are a couple of steps build in to publish your application to the public. 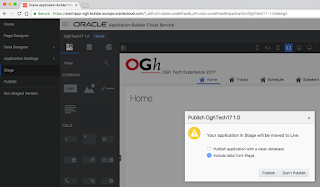 Before you can do this, you first have to go through a Stage environment where you can check the functionality of your application before publishing the application. 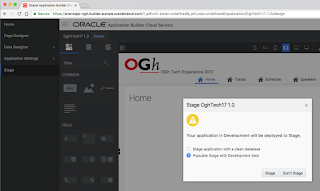 You can decide to start with a clean database, in case you do not want development data to be taken to the stage environment. 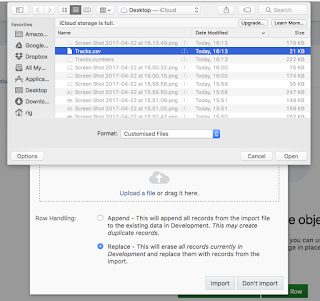 In my case, I want the imported CSV data to be populated to the Stage environment as well, so I choose the option to populate the data. This might take a couple of minutes, after that the menu is changed and you have 2 extra options. 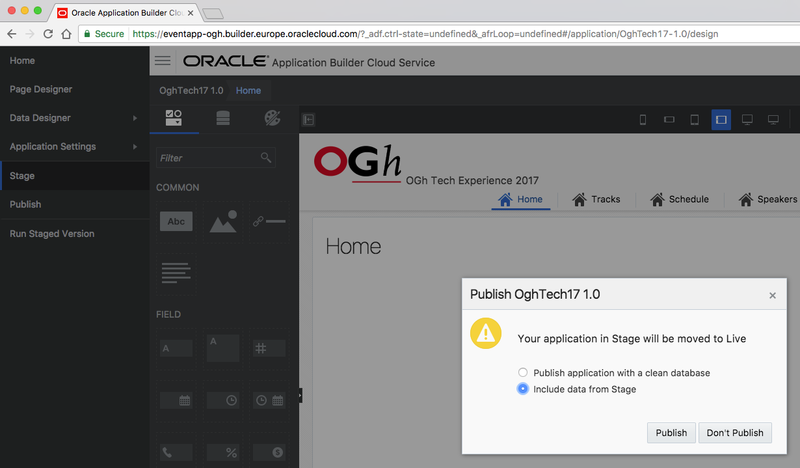 You can now publish your application, meaning it will go into production, or you can run the staged version to verify everything is in order. To verify that the staged version is good, I run the staged version and navigate through the application to verify the data on the Tracks page. The out of the box filter is also working correctly as I can filter on the columns that are displayed in the table. Lets go back to ABCS and publish our application through the menu. 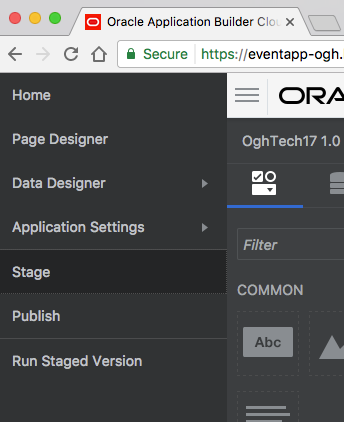 Again you will be given the option to populate the data to production after you have verified the working in the Stage environment. I still want the data to be published as well, so I select the include data option. 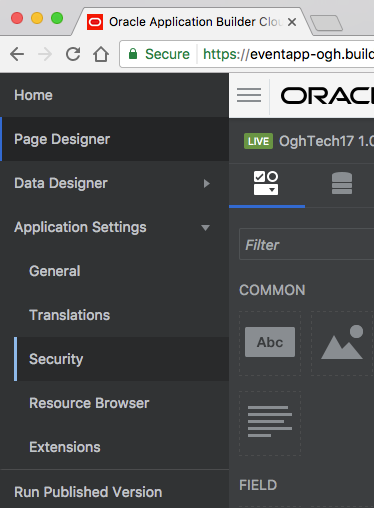 In the menu you can select to run the published version. This brings you to your application that is now fully operational. You can check out the application through here. 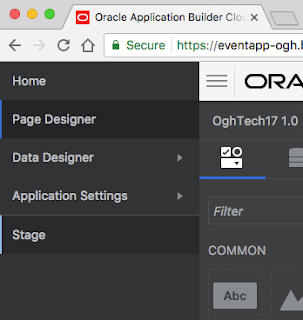 In this use case, I do not let the user fill the data for the application through data entry forms, but rather I use the data that is available for the OGh Tech Experience 2017, this data is in a csv file that I want to upload to display the tracks within the application. 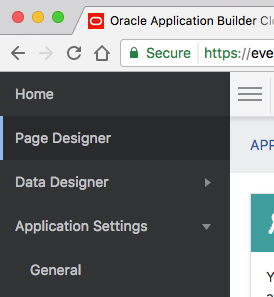 When opening the hamburger menu on the top left, you can leave the Page Designer and go to other parts of ABCS, in this case I am going to use the Data Designer to fill the previously created Business Object. 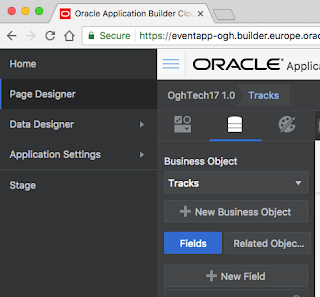 Selecting the Data Designer, gives you a couple of options, here you can create Business Objects, as I have done previously using the Page Designer, you can connect to REST Services (more on that later in this serie) or you can use the Data Manager for exploring, importing or exporting data. 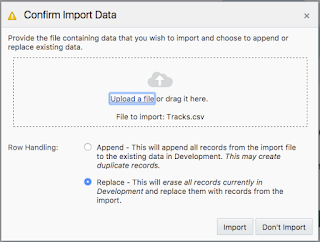 When going in to the Data Manager, there is an option to import to import data from file. 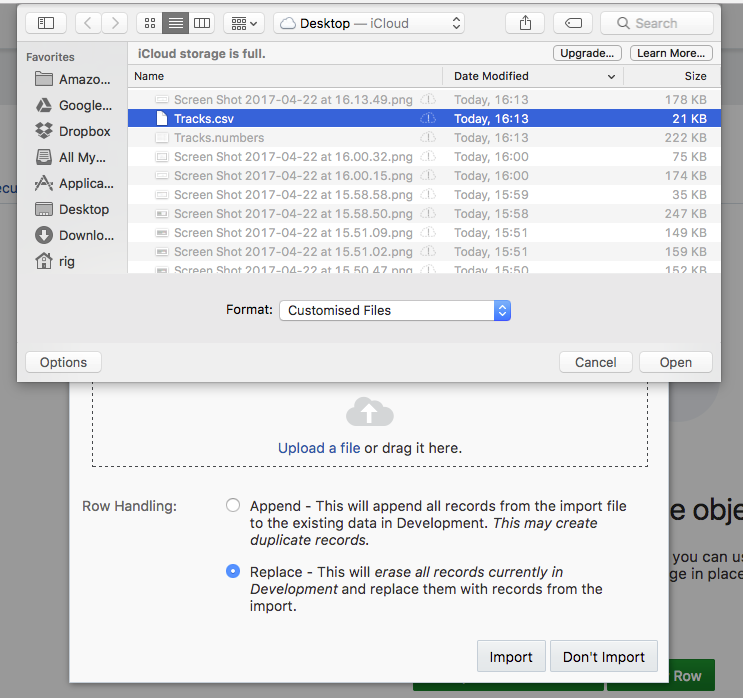 A pretty straight forward UI, that brings up an popup so you can select a file that contains the data you want to import. You can accomplish the same thing, by going to the Business Object itself instead of through the Data Manager and select to import data from a file. 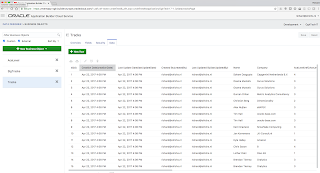 You can browse your local files and select the file you want to use to fill the Business Object. 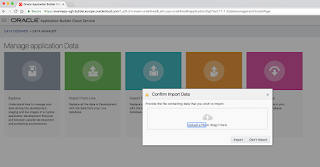 The next step in the wizard will give you the option to either append the existing data or to replace all the current data within the Business Object. 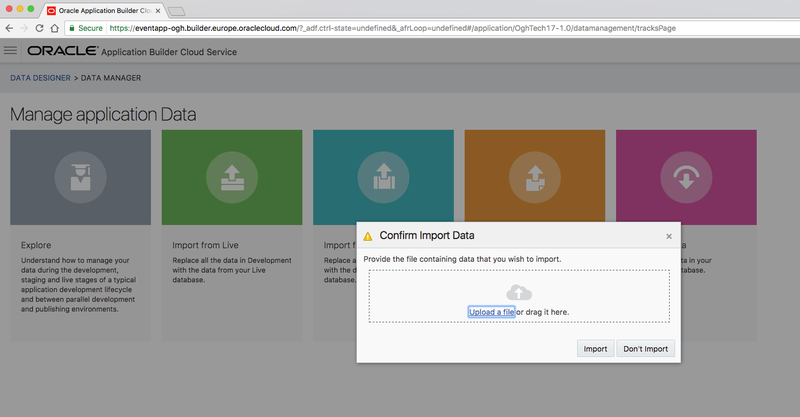 Clicking the import button will give you feedback about possible errors or warnings that occurred that you might want to fix. 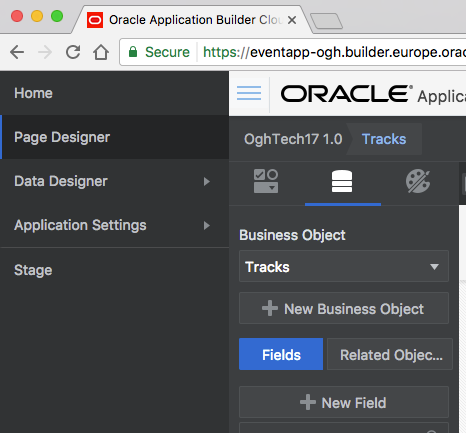 When all the data is correct and you are satisfied with the result, you will see the data being displayed in the Business Object layout. 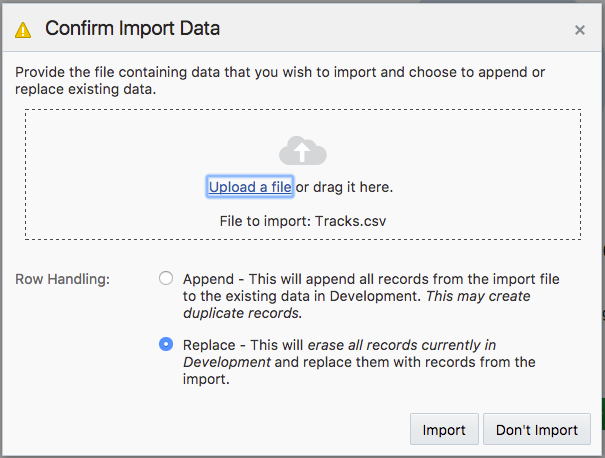 Below the results for the import of the tracks.csv into the Tracks Business Object. 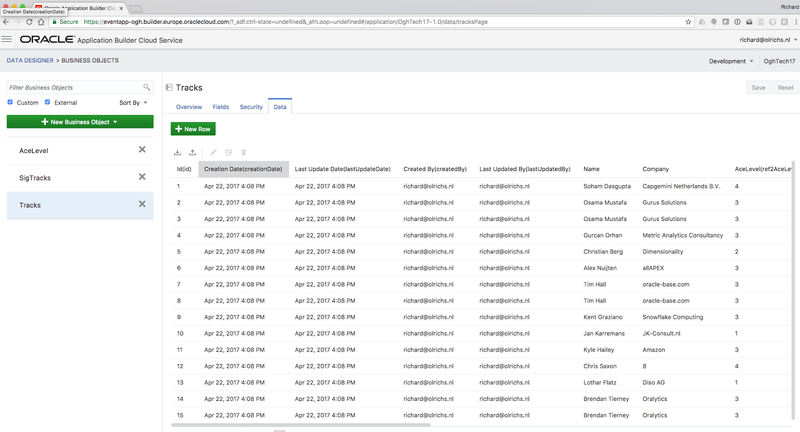 Now that the underlaying data has been supplied, returning to the Tracks page will show the data we have just imported into the Business Object.